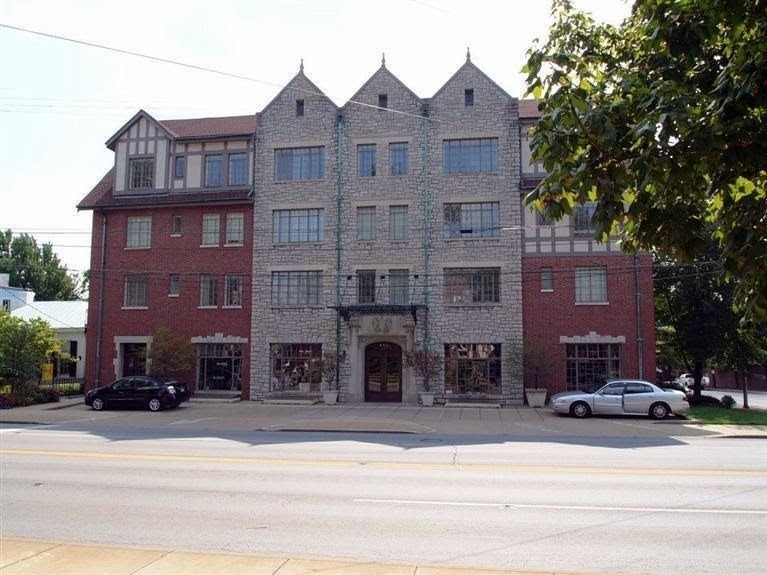 If you’ve lived in Lexington for any length of time, you know the Wellington Arms – the cool Tudor apartment building on the corner of Woodland and Main. Built in 1930, it’s on the National Register of Historic Places and is a true Lexington landmark. 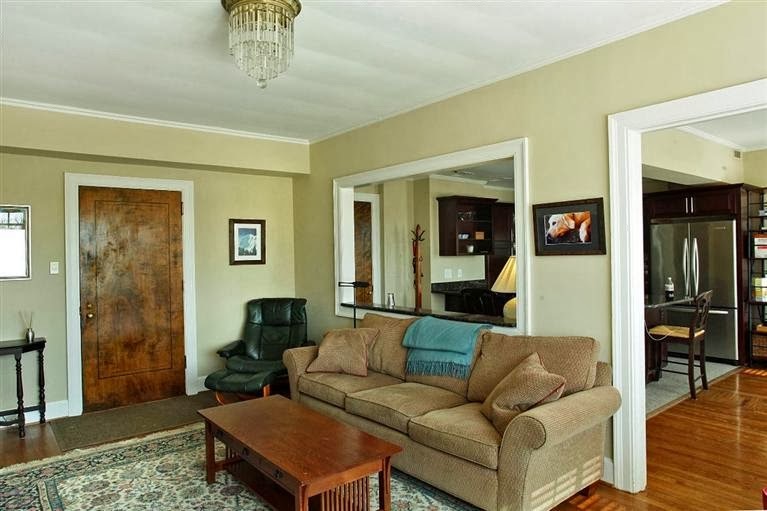 The building lobby is beautifully appointed and the apartments were renovated and condo-ed about 8 years ago with several units being combined into one. The interior of the units capture much of the vintage appeal of the building –original oak floors, beautiful woodwork, glass-paneled doors and charming bathrooms with octagonal tile floors and clean, vintage subway tile walls. 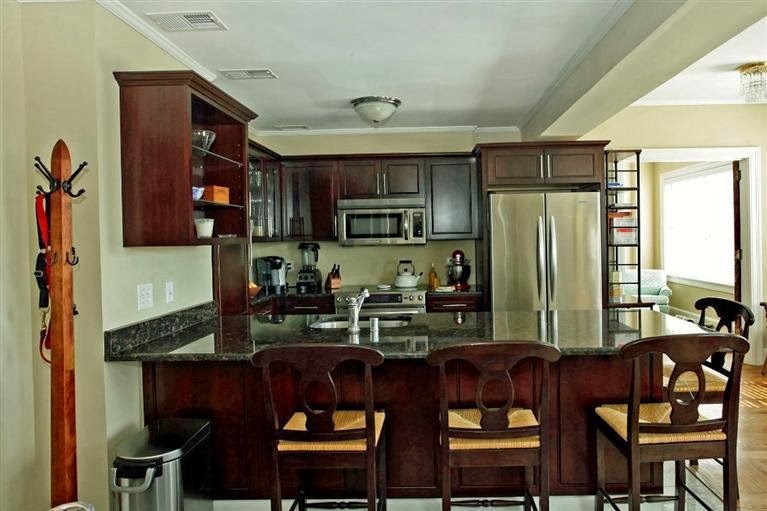 The kitchens are modernized with new cabinetry and stainless steel appliances. The condos look like they ought to be saved on a Pinterest board for upscale urban living. No. 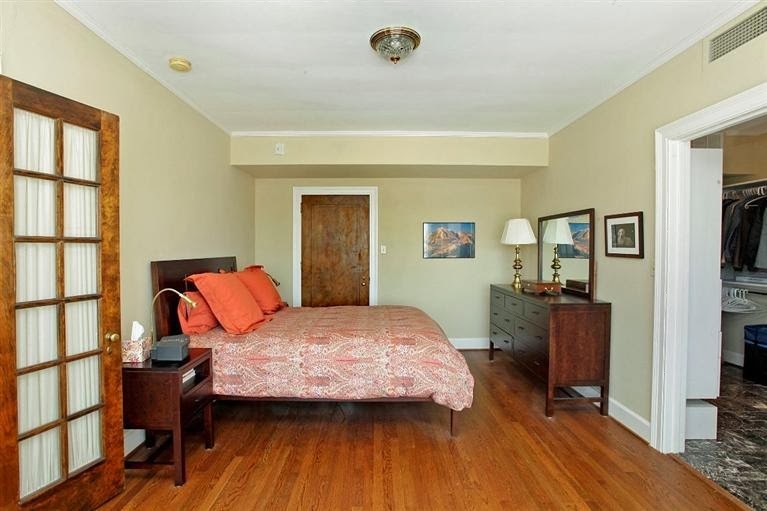 409, is a 2 bedroom, 2 bath unit with approximately 1215 square foot. There’s so much to love here from the fact that it’s the top floor unit, on the green side of the building (so it’s nice and quiet) and there’s a tremendous amount of storage from a large dressing room in the master bedroom to a massive walk-in closet in the 2nd bedroom. There’s an additional un-windowed office/storage closet that features a charming, original glass front cabinet and has a small desk/vanity area. You won’t find anything like that in the new condos elsewhere downtown. And, if the industrial feel of many urban lofts leave you cold, the warmth and beauty of the original millwork and natural light will delight you. 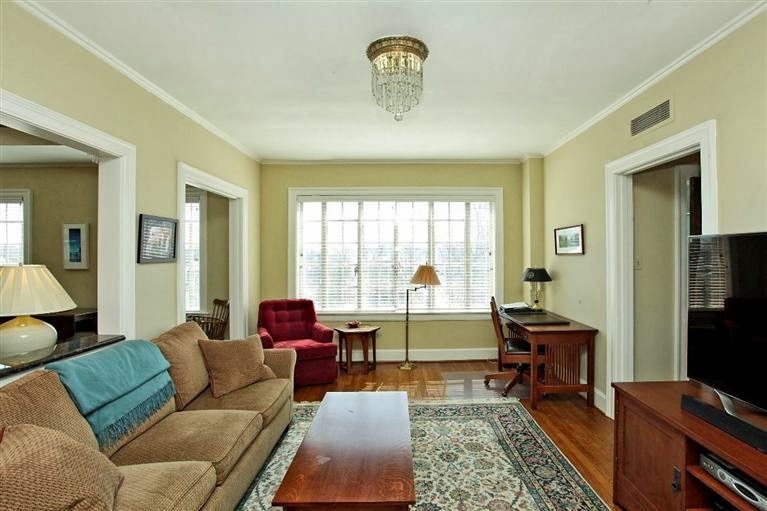 My seller, who wouldn’t be moving if she were going to continue to live in Lexington, tells me that life at the Wellington Arms is just as fabulous as you would imagine it to be. 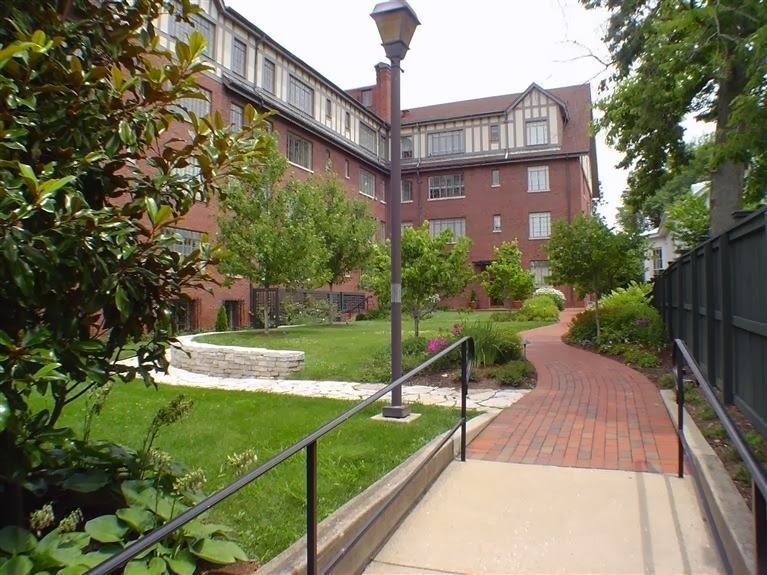 The building has a charming community/TV room where you can host parties larger than you want in your condo, a fitness room for residents that even has classes, and a delightful enclosed courtyard provides a welcome green space. What’s more, you are within walking distance to dozens of local restaurants, coffee shops, boutiques and entertainment venues. Imagine, if spring ever comes, walking to the Kentucky Theater to see a movie and stopping for a coffee on the walk home or to enjoy the beauty of Thoroughbred Park. Or, how about a quick jaunt to the Saturday Farmer’s Market or hopping on the free Colt Trolley and taking a spin on it leaving your car safe and sound in the resident’s covered and secure parking annex. It makes me sad that I can’t fit my family of four and three dogs into the Wellington Arms just thinking about how much fun it would be to live there! Here’s a few pictures of this lovely place at the Wellington Arms. 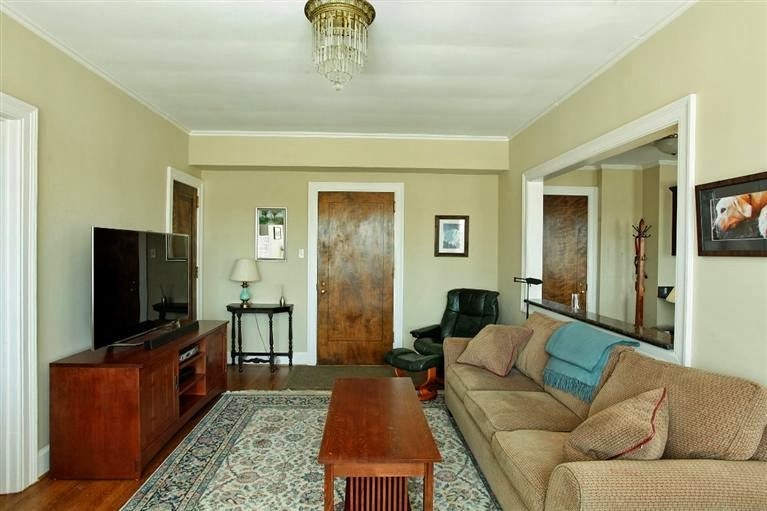 This entry was posted in Uncategorized and tagged 409, 508 E. Main, Lexington condos, Lexington Real Estate, Wellington Arms.